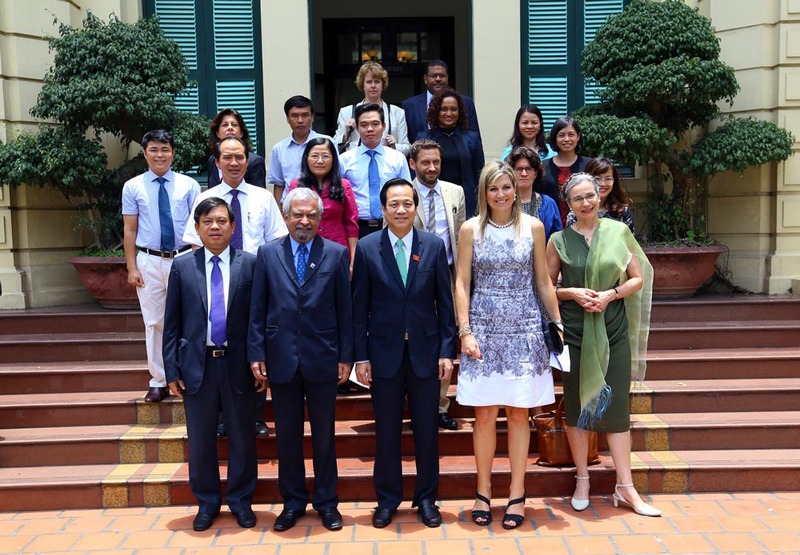 (LĐXH) On June 1st, at the Headquarters of the Ministry of Labors-Invalids and Social Affairs, Minister Dao Ngoc Dung warmly welcomed Queen Maxima Zorreguieta Cerruti of the Netherlands, UN Secretary-General's Special Advocate for Inclusive Finance for Development (UNSGSA) on her working visit in Vietnam. Minister Dao Ngoc Dung expressed his pleasure to see the relationship between Vietnam and the United Nations in general and the Netherlands in particular have positive development on many areas, especially the achievements of poverty reduction recognized by the international community, thereby improving people's living, supporting growth and economic development. It is the result of a number of policies and activities related to the full spectrum of financial aspects such as social security, microfinance development, rural credit, which expanded access to financial and banking services for people. However, a significant proportion of people do not have the opportunity to access and use formal financial and banking services, especially those in remote areas where disadvantaged groups are in demand but have no suitable services provided. According to the minister, comprehensive finance will be an effective tool to mobilize resources and synergy, contribute more to the socio-economic development and sustainable growth of Vietnam. The development and implementation of Comprehensive National Financial Strategy is essential to promote comprehensive financing, requiring a strong coordination mechanism and the participation of all involved ministries and agencies. Dutch Queen Maxima thanked the Minister of Labor-Invalids and Social Affairs for the warm welcome and appreciated the result of poverty reduction of Vietnam in recent years, and the United Nations was ready to join hands with Vietnam to achieve this goal. She also affirmed the importance of the comprehensive financial sector in the development of Vietnam, pay attention to the diversification of financial services, not just the credit card in payment; provide persistent livelihood and other benefits when people encounter difficulties such as floods or illnesses. According to the Queen, by building a comprehensive financial system, the Ministry of Labor, Invalids and Social Affairs (MOLISA) will minimize risks and losses, ensure transparency and attract financial institutions, credit capacity, loans payment of people, small and medium businesses when considering loans. Minister Dao Ngoc Dung said that with the support of the World Bank, the Ministry of Labor, Invalids and Social Affairs recently received project Strengthen the social assistance system in Vietnam, which has been trial in some provinces and areas financed by World Bank loans. The project aims to integrate policies that support poor households managed by different agencies into a package of family benefits in order to effectively use resources for sustainable poverty reduction; separate income support functions for social assistance beneficiaries with the function of providing basic social services (health, education ...), ensuring transparency and direct payment for policy subjects. This is an important content to enhance the financial integrity, contributing to the development and implementation of the Comprehensive National Financial Strategy. 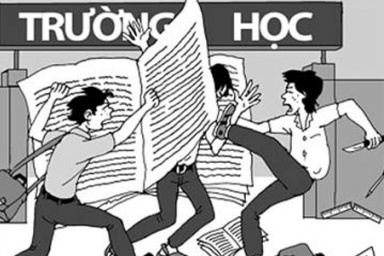 In addition to the results achieved, the Ministry of Labor, Invalids and Social Affairs (MOLISA) is making further efforts to: (i) Promote decent work and adherence to basic principles and rights in the workplace; (Ii) Sustainable poverty reduction through expanding the coverage of social security policies for all people, especially vulnerable groups; (Iii) Elimination of the worst forms of forced labor and child labor; (Iv) Ensuring gender equality and empowering women... towards effective implementation of UN Sustainable Development Goals. In particular, within the framework of APEC in 2017 held in Vietnam, the Ministry of Labor, Invalids and Social Affairs will chair the APEC Senior Policy Dialogue on Women and the Economy, on September 2017 in Hue city. The Minister also signed the invitation to the Queen to present her message directly through a video clip in the Women and Economic Dialogue on Women and the Economy of 28 September 2017 and contribute to the overall effort to narrow the gap gender in the context of globalization today. On May 30-31, during the visit to Vietnam, Dutch Queen Maxima Zorreguieta Cerruti met and worked with the President Tran Dai Quang; shared experiences in the field of universal finance as well as supported Vietnam to develop and promulgate the National Universal Finance Strategy by 2020. At the same time, she also visited businesses, farmers in Don Duong district and Da Lat (Lam Dong Province) to discuss the project financial support in agricultural development.